A dash of brown rice vinegar or a small squeeze of fresh lemon juice. If you are using a homemade stock put it on to a high heat so that you can be bringing it to a simmer while you prepare your ingredients. If using a cube or bouillon then boil the kettle so you have hot water ready! Put your saucepan on to a medium high heat and pop in your coconut oil to melt. Meanwhile chop your garlic and have your nigella seeds, chilli and turmeric ready. Start chopping your sweet potato into inch size cubes. don’t peel the potato – the skin is good for you! Once the oil is melted and warmed put in your nigella seeds and chilli to sizzle. Add in your garlic- giving it the odd stir to stop it burning. Now add in your turmeric powder- and a tiny splash of water or stock so that it doesn’t burn and leave it cook for few seconds. Add in a cup of stock and throw in your sweet potato. Add in your dried oregano and dried dill. Add your salt and pepper. Make sure the potato is just covered by stock- so you will prob need to add the second cup now. Cover the pot so the potato can cook. Wash your org mushrooms. I like to chop a few of them really finely so that they can impart more flavour and then thinly slice the rest ( I save a few from blending near the end as I like the odd bit of mushroom in my soup). Now chop your broccoli, peel the tough stem and chop this too- it is very nutritious! This should have taken a few minutes unless you are super skilled with a cleaver! Add your shiitakes to the pot and put the cover back on. Get your fresh herbs ready. Keep a big dessertspoon of chopped chives for later. Add in the fresh oregano and chives. Keep the top off the pot- as you want the water to reduce a little. Check if the sweet potato is nearly cooked. It should be softish and certainly no crunch to it. If it is nearly cooked and in your chopped broccoli. Press the veg down so the water is pretty much covering everything. Leave it to simmer. Grab your can of coconut milk and take a spoon of the creamy stuff off the top. This is to add to your soup when serving. Check how the broccoli is cooking. If they are nearly cooked add in your coconut milk. You will need to stir it through so the creamy goodness mixes in properly. Reduce the heat to medium, you just need to leave it cook for another few minutes so the broccoli is done and it has all warmed up to a simmer again. Add a dash of the brown rice vinegar or a squeeze (half a teaspoon) of lemon juice. The acidity really does help bring all the flavours together. Take it off the heat so it is not a danger to you when you blend it. If you are using a jug blender ladle in the chunky bits first and pour the liquid. If you like save some mushrooms from the mushing and leave them in the pot/ Blend to creamy- takes about a minute in my blender. If using a hand blender: again take it off the heat! 🙂 You need to make sure the veggies are properly cooked so your blender doesn’t hate you. Don your apron and get to blending! Now put the creamy green soup back on the heat inc the shiitake mushrooms you saved. You may want to add a little hot water if it is too thick. You should have some chopped chives left. Add half of what you have left- approx. a teaspoon. Now have a taste and see if it needs more pepper or salt. Don’t leave it boil or you will loose flavour. Just warm it enough for it to be ready to serve. Pour it into your bowls and a teaspoon of your creamy coconut and a sprinkle of chives. Ta-da! Voila! Green Hearty Creamy Veg and herb soup! 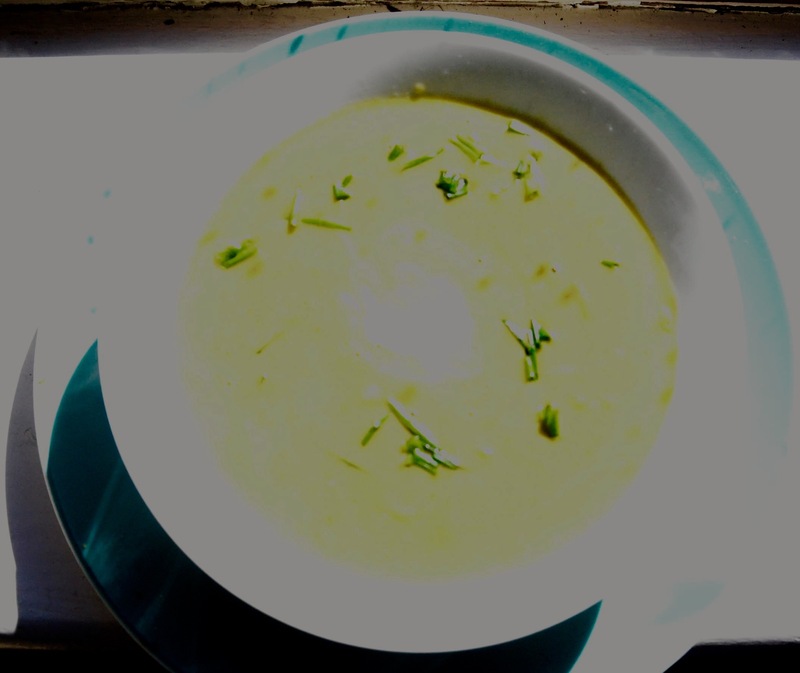 Over exposed soup! 😦 I can’t take another photo because I ate it!!! 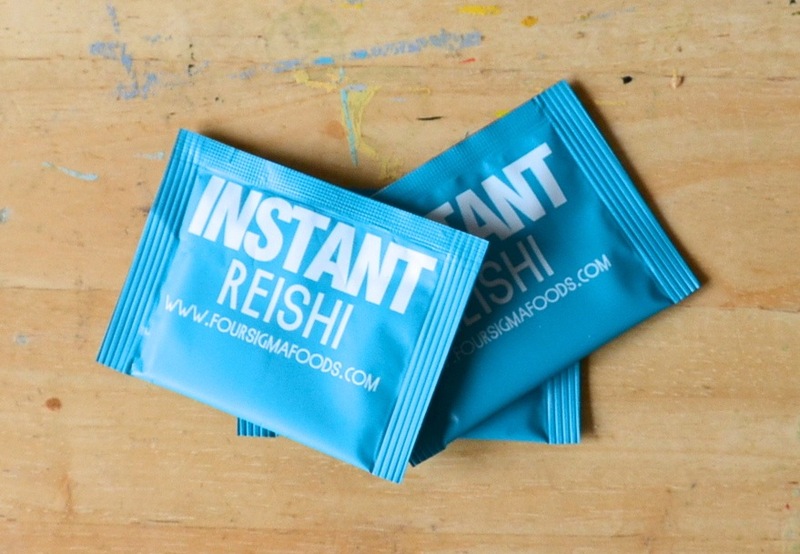 Functional Sweet Treats with reishi! These are packed with good stuff! They taste pretty amazing too, if I don’t say so myself. Tomorrow I am helping to give a demonstration to nutrition students, it is on how to use medicinal mushrooms ( I did this morning, it went well 🙂 ). I am bringing along sweet goodies made with reishi mushroom powder. Reishi has been used for thousands of years. It is one of if not the first medicinal food to be written about, in China roughly 2,000 years ago!Paul Stamets is a good name to look up if you want know more about these natural powerhouses, his Ted talks are a good intro. Savoury is generally they way we go when it comes to mushrooms but why not with cacao? Or blueberries? Think of the antioxidant levels! Picture the immune boosting! Discover their adaptogenic properties!! Imagine the tastiness! Half a ripe avocado- should a bit of give to it when pressed and be going a dark sap green colour. Two generous dessertspoons of raw dark agave/ date syrup / maple syrup. Whichever you prefer. A half teaspoon of vanilla powder or the scraped inside of one vanilla bean. A quarter of a teaspoon of good quality sea salt or himalayian pink salt. A third of a cup of organic desiccated/shredded coconut. For sprinkling on top or rolling in. *This is about double the goji needed. I do more incase some stay a bit hard and eat the left overs. Yum. *If you are using reishi capsules make sure there are not tons bulking agents, these could change the flavour. One capsules may do, go by taste. Grab your soaked goji berries. It really is up to you what you would prefer. I don’t want goji lumps on my cacao reishi fantasticalness so I cut or shred my softened gogis. If you like big hits of the gogi then just chop them in two. Put them to one side for use as a topping later. 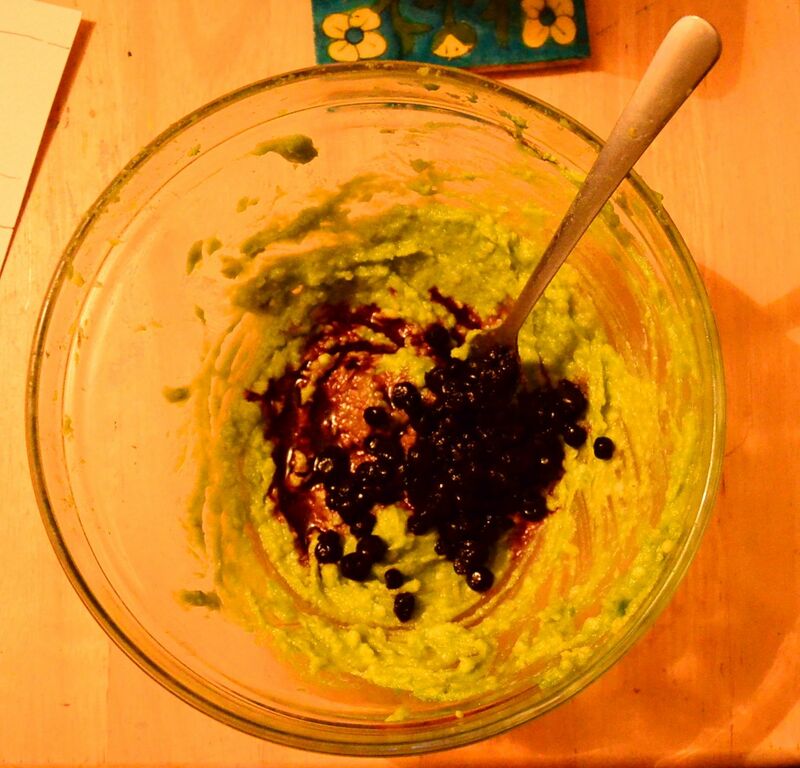 Mash your avocado and coconut oil together. Add your one dessertspoon of the blueberries and mash again. Should be a creamy paste. Add the liquid sweetener and Mash MASH mash… again. Add the other spoon of blueberries and mix through. I press this less, as I like having more whole pieces of blueberries too. Colourful even in the orange light of my kitchen-diner. In another bowl combine all the dry ingredients (except for the coconut, that is for on top). Make sure there are no lumps of ground almonds or cacao. Sprinkle the salt in so it is evenly dispersed. Add the dry things to the omega rich, mct containing, antioxidant abundant….stuff. 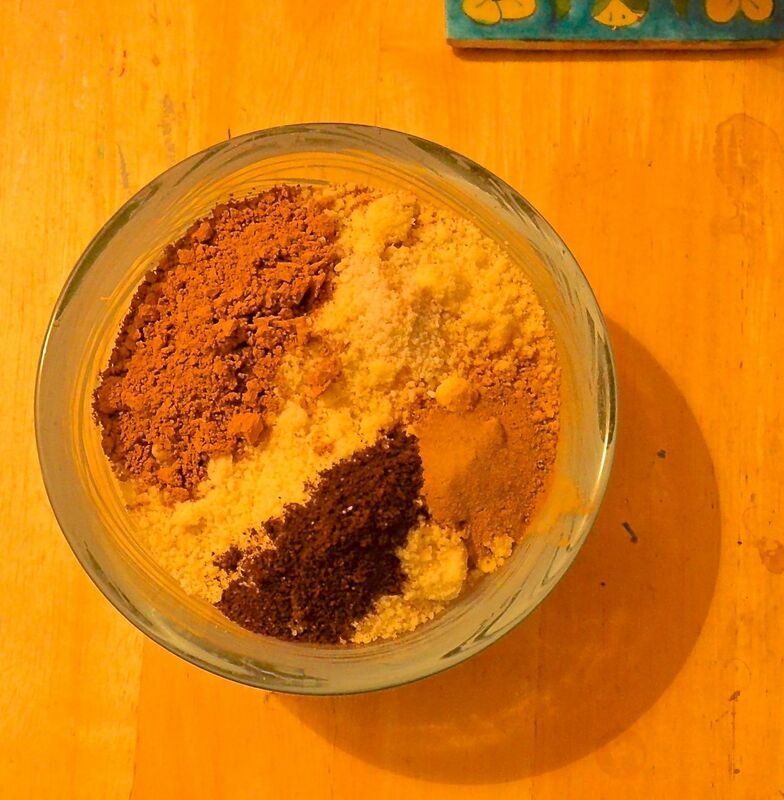 Mix, stir, combine and merge the ingredients. Pressing the mixture to make sure the fats are taken up well. My preferred Option A: You can roll them into teaspoon size balls. Prepare a plate with your gojis and one with coconut. 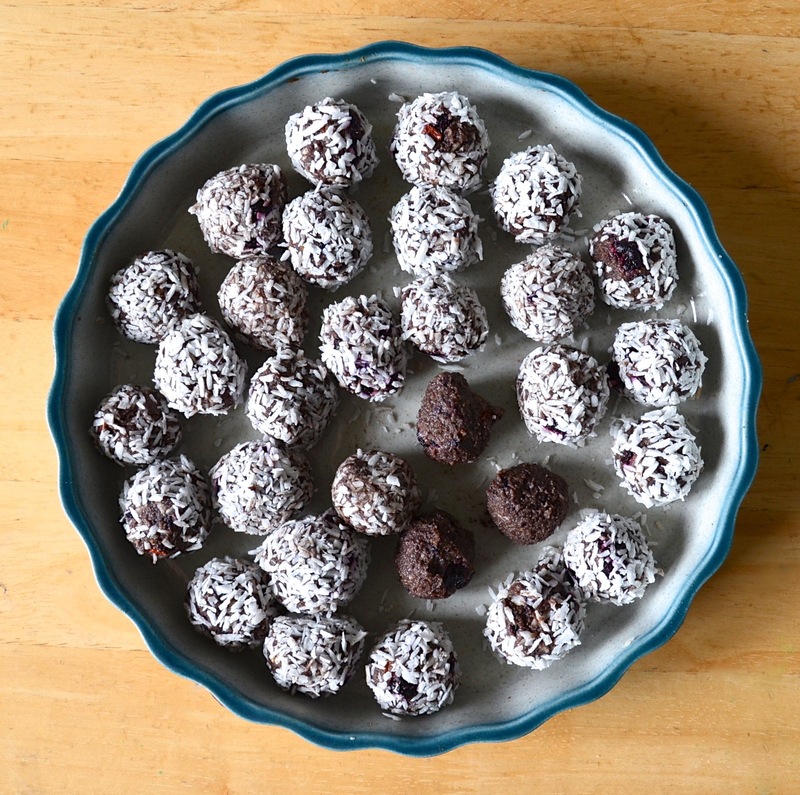 Roll the balls in goji and then roll them in the coconut. Pop them on a dish and stick them in the fridge to set. They need to live in the fridge (and die in your tummy) as they will go squidgy when left unchilled. Option B: Get a 7.5 inch cake tin/ tart dish and spread the mix a one centimetre deep. Ah the mixed measurements! That is 20cm cake tin and a quarter inch thick! 😉 You can the sprinkle and press the goji and coconut on top. Pop in the fridge for fifteen minutes. Take out and cut into one inch (2.5cm) squares. Put in the freezer to set. It is happier in there all the time really. It gets shy and melty at room temperature. P.S. There is a wealth of info on line but here are a few of links about reishi!